Two weeks separate us from the announcement and, apparently, market launch of the Samsung Galaxy Note7, and the myriad of leaks has so far left little for Samsung to surprise us with. 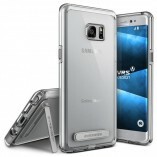 Casemakers don't help either - some listed their products a while ago, others only just. 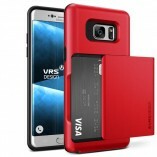 VRS Design falls in the latter category, and it has launched a wide range of cases to accompany the upcoming Samsung phablet. Now, we'll refrain from debating the pros and cons of the various models in terms of looks vs features, but rather stick to the Note7 itself. Sure we already know it'll sport a dual-curved display, and this manufacturer's renders show exactly that. However, the S Pen has so far been little more than a hole in a drawing, and somehow none of the lucky folks to have handled a Note7 seems to have taken any interest in it. The VRS renders, on the other hand, show the stylus' top end (at the bottom of the device, obviously), which seems to be a similar design to the one on the current Note5. That would mean click to eject, and hopefully Samsung has learned its lesson and foolproofed it better this time to avoid unpleasant Pengates. One more bit that gets another confirmation is the USB Type-C port. 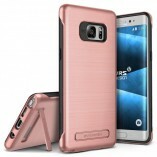 The Note7 thus looks set to become the first Samsung smartphone to sport the next standard port design, after the Korean company took the conservative approach and stuck with microUSB 2.0 for the Galaxy S7 in the spring. Then why are you complaining here knowing fully well they're not going to give you these underused or unpopular features? Keep your heaping pile of money they'll still make bank without you. Nah, let Samsung get used without my 800Â€, not a big deal. Lol stereo speakers aren't necessary due to its other top-end specs (unless you're a serious audiophile) and IR blasters' all but extinct, get used to the curve bc there will be no flat version.